Also known as: "t Smisje Dubbel Dadel"
11/11/2018 @ sample of 33cl bottle @ Vergeten Bieren tasting, Brouwerij Smisje shared with Koen and the brewer himself. 2010 version. Red brown with nice head. Nose and taste is dark malts, bit chocolate, hint of fruits. Damn still nice after all these years. The aroma is caramelized and dried fruits on the sidelines. Almost on a Christmas ale-like fashion smells of prune, plum, dates and raisins. The taste follow up its aromas and all the fruits can be tasted in the beer. It has 9% alcohol, but leaves only a residual heat in the mouth. The taste is hardly affected by the high alcohol content. It is an extremely tasty and well-brewed dubbel, and you should definitely buy if you get the chance. 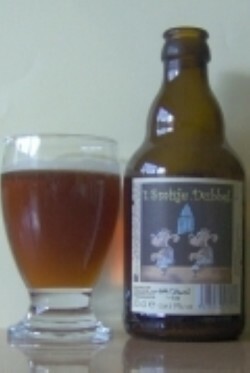 One of Johan Brandt’s old Regenboog beers, also tasted in its original form called ’t Smisje Dubbel Dadel, which was a bit less hoppy. This later, but now also discontinued version had a light beige, loose, thinning but stable head and deep bronze colour with chocolate brownish hue, cloudy with deposit. Aroma of caramel, candied dates, plums, pear, grassy hops, ginger, cinnamon, liquorice and some DMS (red cabbage). Malty taste with refreshing fruity touches, dryer in the middle with some spiciness and a long, peppery hoppy finish as well as warming, even somewhat astringent alcohol. Bottle: Served in a Chouffe glass: Medium sized off white creamy foamy head on top of a hazy pink purple ruby red colored beer... Aromas of oatmeal, toast, corn, syrup, some raisin, strnge herbal malty tones, some nuts, hay, some bread and light sprinkle of rye. Flavours of raisin, prunes, malts, toast, molasses, syrup, dust, earth, bitters, some herbs, bread, light oatmeal, some yeast and warmth. Aftertaste is biter, malty, toast, herbal and some dusty oat. Low carbo, creamy close to silky mouthfeel, medium to lightly fuller bodied and a creamy texture. Dark brown colour, beige head. Good dubbel beer. Sweet with notes of caramel and some roastiness. Well balanced. Bouteille de 33cl. 2kw-2014. Bière brune un peu sale avec une mousse beige durable. Un nez fort intéressant de chocolat épicé avec du caramel et des dattes. La bouche est tout aussi plaisante, l’alcool est discret, les épices sont au rendez-vous, une touche de chocolat et de caramel agrémentent cette offre. Un peu sucré mais pas trop. Les dattes apportent une certaine rondeur. Fort sympathique. Bue au Saint-Bock. A truly delicious Belgian dubbel. Very malty and yeasty, with lots of spices and fruits. Typical, but nice belgian dubbel. amber,dark, sweet, malty...some dark fruits and candy aftertaste. 2008 bottle shared. Pours cloudy brown with a thin tan head. Aroma of caramel, overripe dark fruit, prunes, chocolate and a slight funky sourness (maybe not aged too well). Flavour is over moderate sweet, light bitter and light sour. Medium to full bodied with soft carbonation.